Properly pan-fried fish is a sheer delight. The crisp outer coating lends a pleasant flavor and texture while protecting the delicate flesh inside. Japanese-style panko bread crumbs are the best at giving fish the perfect crisp and golden shell. Arrange the work surface from left to right with two plates, a shallow bowl and a third plate. On the right, place a sheet pan lined with wax paper or plastic wrap. Place the fish fillets on the first plate. Fill the second plate with flour, the bowl with milk and the third plate with panko crumbs. Season the fillets lightly with salt and pepper. Dredge a fillet in the flour, taking care to coat both sides thoroughly. Shake off any excess and dip the fillet into the milk. Finally, dredge the fillet in the panko crumbs, thoroughly coating both sides. Place the coated fillet on the sheet pan. Repeat for each fillet, adding extra flour, milk or crumbs if necessary. 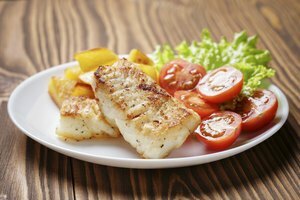 Refrigerate the coated fillets for at least 15 minutes or up to 2 hours if preparing ahead of mealtime. This allows the coating to "set" and adhere to the fillet. Preheat the oven to 200 degrees Fahrenheit. Line a clean baking sheet with parchment paper and place it in the oven. Pour about 1/4 inch of oil into the skillet and heat it to medium. For light, non-greasy results, the frying temperature of the oil should be in the range of 380 to 400 degrees Fahrenheit. When the oil is hot and shimmering, place fillets into the skillet a few at a time, without overlapping them. Flip them when the underside is golden and continue cooking for a few more minutes. For all but the thickest fillets, the fish will be cooked once the breading is golden. Transfer the fillets to the sheet pan in the warming oven. Allow time for the skillet to return to 380 to 400 degrees Fahrenheit and repeat the frying process. Add a little more oil, if necessary. Serve while fresh and hot with your choice of side dishes. Fried fish is best straight out of the pan, but keeping the fillets warm in the oven helps. 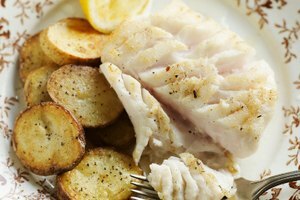 Choose firm-fleshed white fish, such as cod, halibut, perch, pike, bass or sole. Use oils suited to high-temperature cooking, such as canola oil, coconut or peanut oil. Olive oil is not a good choice due to its low smoke point. 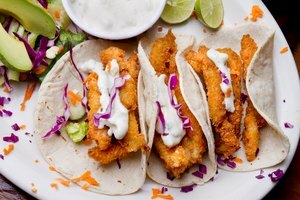 Fish is easily infected by food-borne illnesses such as salmonella and norovirus. Buy fish from a reputable supplier, keep it refrigerated and use good hygiene and food safety while preparing it. Hot fat can cause fires or severe burns if not handled with care. Never leave the room when working with hot oils, and keep children away from the work area.